My personal choice in the Nadi area is Natadola beach, with its pure white sand, clear water, and swaying palm trees. Its wild and raw, with almost no foreshore development… It is a”Mainland” beach about an hour from Denarau and a FJ$180 taxi return fare. You can make a day out of it and have lunch at the Intercontinental hotel by their infinity pool, or at Yatule hotel. You can surf, body board, snorkel and/ or horse ride. See an example of a family photo session here. My transfer fee to Natadola : FJ$90. 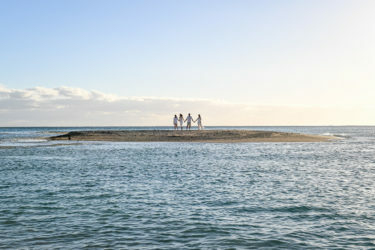 Malolo Island is also a great choice for a day trip and a photo shoot. With white sand, clear water and stunning reef viewing and views; you are already in the world famous outer islands of Fiji and only a 50 minute ferry away from Denarau marina. (return FJ$140 per person) – It really is a great day out, there is incredible snorkelling and a water park for children under 16 at iconic Plantation islands resort that famously welcomes day trippers. See an example of a family photo session here . Ferry information here. My transfer fee to Malolo is : FJ$140.